2 bottles still rosé wine. ¼ cup elderflower liqueur, such as St-Germain, optional. 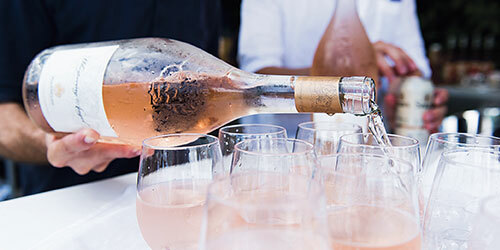 1 bottle rosé sparkling wine. 1 cup sparkling water or soda, such as Topo Chico. In a punch bowl, pitcher or similar large container, combine the still rosé, fruit and liqueur, if using. Give it a good stir and, if you have time, allow to macerate in the fridge for at least 1 hour (though overnight won’t hurt). Just before you serve, add the sparkling rosé, water and mint. Serve with fruit floating in the glass and a mint-sprig garnish. Makes: 8-10 servings.